There are so many different fundraising items to sell. You may be overwhelmed with options. We’ve picked out top five products based on affordability, quality of product, and value to your donor. Candles are popular especially during the winter months, and they appeal to a wide audience. With popular household name brands available, donors know they’ll get a quality product. Profit margins usually sit around 40%, which is near the high-end when comparing other fundraising items to sell. Candles can be expensive for your supporters. Spending $16 on a small candle may be a tough sell. If kids are responsible for fundraising, candles may not be of much interest to them. And the fact remains, you have to receive, coordinate and deliver the candles when they arrive to your donors...and a box of candles is more than a child can carry. Add to that, if you're selling candles in glass jars, you may see breakage cut into your profits. Snacks and candy are very common fundraising items to sell — and for good reason. They usually have reasonable upfront costs for you, and offer good profit margins of around 40%.As inexpensive and showy gifts, assorted popcorn tins are a big deal around Christmas time, and other snacks are year-round favorites. Oftentimes, fundraisers using snacks and candy require your donors to order from a catalog. This puts a step between them and the product. With these kind of fundraisers, there is no instant reward when making a donation. In addition, the quality of the food can be hit-or miss...and you certainly don't want to disappoint your donors. Coupon books have an attractive selling point: they’re “worth” thousands of dollars in savings. Some coupon book programs offer zero cost upfront. There’s a wide variety of coupon books available, and many of them offer very high profit margins, between 50 and 75%. Donors who have bought coupon books from previous fundraisers in your community will be reluctant to buy a fairly expensive book of coupons without knowing the value of the offers and the quality of the businesses making these offers. Popular pizza franchises offer discount cards. The cards vary in value, but the best ones offer up to twenty “buy one, get one free” deals. Others may offer a couple of dollars off a large pizza. The chains that offer these cards are easily accessible and well-liked. The cards are reasonably priced at around $10. Build-your-own pizza kits can offer better profit margins than discount cards. An average profit margin is very low when someone uses your discount card, at around 20% of pizza sales. Because local franchisees are responsible for specifying the discounts, some cards don’t offer a ton of value to donors. World’s Finest® Chocolate provides a lot of value in three areas: profit, quality, and speed. 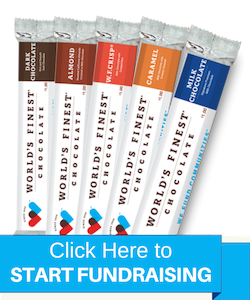 One of a handful of chocolate manufacturers that make premium chocolate right here in the U.S.A.
No ordering catalog needed for your donors. They can eat their chocolate right away! Each bar will cost donors $1 or $2, depending on the size of the bar. With several chocolate varieties available, like almond, mint, and caramel, it’s tough to turn them down! Kids may find it tough to resist eating the fundraising products they’re supposed to sell! It’s easy to get started with World’s Finest® Chocolate. Get in touch with your local representative, check out our chocolate shop, or get your free fundraising guide. We look forward to hearing from you!